Vita Frames creates carefully crafted fine art picture frames with a high regard for ‘truth to materials’, craftsmanship and sustainability. 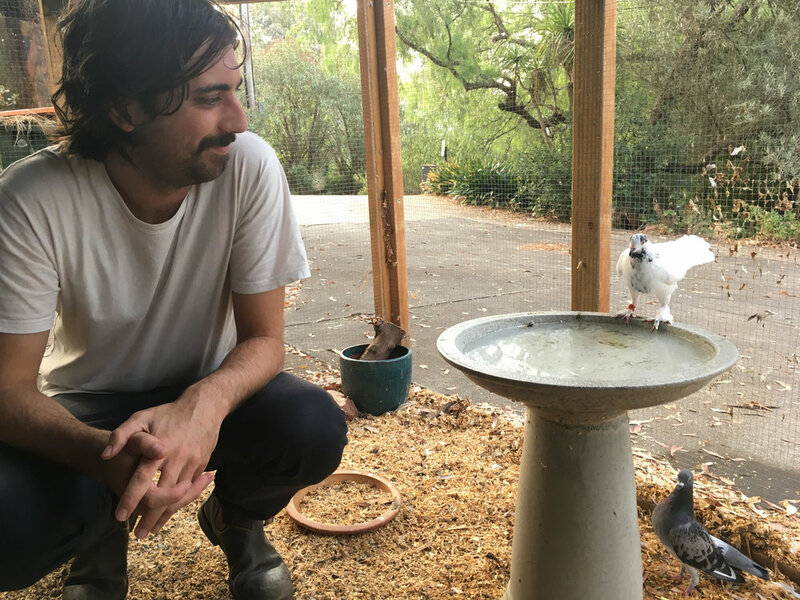 Now approaching its first birthday, Vita was created by artist and photographer Jake Yugovic and named after Jake’s rescue pigeon, Vita. In his framing practice, Jake takes every care to use environmentally friendly materials and reduce waste where possible. You can find Vita (the business, not its namesake pigeon) inside the Fox Darkroom and Gallery in Younghusband by appointment, and on their website and on Instagram. 1. When and what sparked your interest in framing? My mum is an artist, so we’ve always had things framed and hung on the walls at home. But I think I became more aware of the importance of framing when I started making my own creations. Once I started framing things properly I realised how vital it is to display works in a way that gives them life, and allows them to “breathe”, so to speak. 2. Why the name Vita Frames? The name comes from a lovely pigeon that my partner and I adopted. We do a bit of animal rescue from time to time, and as I was getting ready to launch the business we got a call about a pigeon that was going to be put down, and they asked if we wanted to look after it. We had room, so we said yes, and she joined our little flock of misfits. She watched me build the business from day 1, and so I named it after her. 3. How long have you had your space at Younghusband, and how did you hear about it? Well, in addition to Vita Frames, I teach the photography workshops at the Fox Darkroom & Gallery, which is also at Younghusband. So, I’ve been working in the building for about three and a half years, but Vita Frames is a new venture – I set up about eight months ago. 4. What’s your favourite thing about Kensington? It’s got a nice relaxed feel about it – almost like a country town. There’s lots of trees, nice cafés, a great bakery, and it’s right on the train line, so you’re not actually far from the city at all. 5. What is the most unusual thing you’re framed? So far, nobody has brought in anything too strange. But I did frame a tiny painting of an elephant that was about 2cm x 2cm. Who knows, maybe someone will bring in an old saucepan to be framed with a spiral pasta border tomorrow? 6. Other than being an artist making frames, do you produce any other art? Yes, I’ve been a photographer for many years, but am revisiting sketching and making woodcuts and linocuts at the moment. Many of the ideas I am interested in with creative photography like texture, shape, memory etc. translate to almost any medium, so it’s been quite fun – it’s all the same language. 7. What’s your absolute favourite framing material, and why? There’s a very strong and beautiful type of Japanese tissue called “kōzogami”. It’s made from the long fibres of the kōzo plant (Paper mulberry) to make stable, archival hinges for mounting works on paper. Japanese tissue has a long history, and is used by museums and art galleries around the world. There are other types of archival hinges, but kozogami has stood the test of time, and is just lovely to work with. I also enjoy working with second-hand tools. The ones that have been looked after well are often made of high quality steel, and have beautifully carved or turned fruitwood handles. Some tools need to be new, but most of the time old tools just need to be sharpened and tuned up again, so it feels good to give them a new life. 8. It sounds like you’ve got a “truth to materials” approach to framing? Yes, the range of wood, mat and glass I stock are chosen for their quality and aesthetics. My mouldings are raw timber, which I then cut, join and stain by hand or finish in a natural water sealant. I don’t use any veneers or pre-fabricated mouldings – I believe frames should be simple, elegant and made properly. 9. You actively choose sustainable materials for your work. How did you come across matboard made from off-cuts from the textile industry? Yes, one of the main goals of Vita Frames was for it to be as environmentally friendly as possible. All the woods I use are certified sustainable by the FSC and the Responsible Wood Standard. I also donate $5 from every frame I sell to the Australian Conservation Foundation. But actually, it just so happens that the company that makes some of the best matboards just happen to use off-cuts, so it was a happy coincidence. Most other matboards are made with wood pulp, which is then buffered and coated in calcium carbonate. They also tend to use somewhat toxic glues to adhere the surface we see in the frame to the main body of the mat. The matboards I use are made entirely out of cotton, but they don’t use the fluffy cotton flower we usually think of – they use the linters, which are discarded in the textile industry as the fibres aren’t suitable to make clothing. So they salvage all that wasted cotton and make excellent quality naturally archival matboards that are a favourite with framers and artists around the world. 10. How did you learn the technical side of framing? Does it run in the family? My introduction to framing was the good old “pin it to the wall” technique, which looks really fantastic in a gallery for sketches in charcoal or something similar. Once I started to put more effort into my photography though, I wanted to learn how to support and protect works over time. After some practice at home, I studied with the very talented Rafael Bieber – a fine art framer and teacher in Fitzroy. He’s a lovely man – very careful and patient, with an outrageous and silly sense of humour. 11. Where is your favourite spot for a coffee in Kensington? I often go to Crumbs Organic Bakehouse for coffee, as they have a delicious selection of vegan pizza slices, doughnuts, muffins, slices, croissants etc. – it makes you wonder why we still make things with animal products when we don’t need to? They supply lots of Melbourne’s cafés with their goods, make great organic sourdough bread too!